GLOMAC Bhd registered a net profit of RM21.9 million in its third quarter ended January 31 2012, up 32.7 per cent compared to RM16.5 million in the previous corresponding quarter. In a statement, the property group said its net profit attributable to shareholders for the first nine months of its financial year rose 32.2 per cent to RM63.5 million from RM48 million achieved in the previous corresponding nine-month period. This surpassed the company's full-year net profit attributable to owners of the company of RM63 million in its previous financial year ended April 30 2011. Consequently, Glomac's earnings per share for the nine-month period jumped 34 per cent to 11 sen from 8.2 sen previously, it added. Glomac has proposed an interim dividend of 2.75 sen per share less 25 per cent tax for the current financial year ending April 30 2012, higher than the 2.25 sen interim dividend paid in the previous financial year. "We are riding on a healthy growth momentum. Not only have our results continued to excel, we chalked up property sales of RM343 million in this nine-month period, well on track to achieve our target sales of RM500 million for the whole financial year," said Glomac Group executive chairman Tan Sri F.D. Mansor said. He added that the group's townships are thriving with launches in both Bandar Saujana Utama and Saujana Rawang enjoying good take-up rates. F.D. Mansor also said that the company's current projects, namely Glomac Cyberjaya 2 and Glomac Centro have also been well received. Glomac Cyberjaya 2, which has total gross development value (GDV) of RM130 million, was launched in November last year. Glomac Centro, meanwhile, which will be launched later this month, will have a GDV of RM370 million. "We are also looking forward to the upcoming launch of our 39-storey Reflection Residences, a freehold serviced apartments project with a GDV of RM270 million in Mutiara Damansara," he said. F.D. 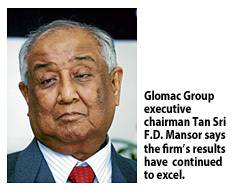 Mansor said Glomac has built up a substantial "war chest", which will allow it to acquire new landbank. Glomac's balance sheet, as at January 31 2012 stood at RM353.5 million in cash and cash equivalents. The company recently required two parcels of leasehold land totalling 80ha for RM44 million, adjacent to Bandar Saujana Utama. This would raise its total estimated GDV of current and future projects to RM6 billion. Meanwhile Bernama reports that Glomac Bhd's sales are expected to pick up in the fourth quarter of the 2012 financial year, with RM640 million worth of new launches by end-March, said Maybank Investment Bank. In a research note yesterday, it mentioned the launches of Reflection Residences and Glomac Centro shop offices and serviced apartments, both in the Klang Valley. "We believe projects in good locations such as Reflection Residences will continue to attract buying interest," it said. Maybank Investment said Glomac has locked in RM343 million worth of property sales in the nine months of financial year 2012 (FY12), meeting only 69 per cent of its FY12 target. It said Glomac's 2012-14 earnings would be driven by RM418 million in property sales achieved in FY11 and new launches worth RM1.4 billion this financial year. 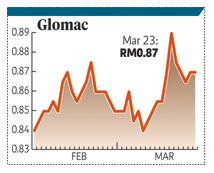 Maybank Investment has maintained its 'buy' call on Glomac with a target price of 96 sen.